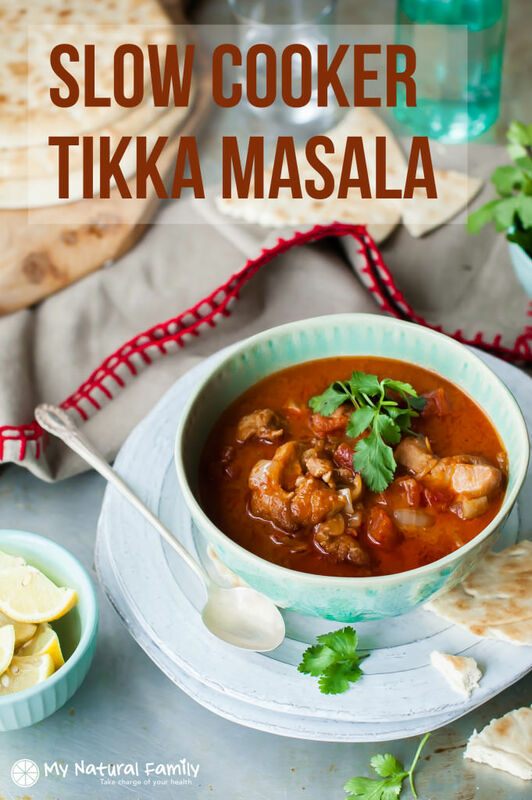 This slow cooker tikka masala recipe is so easy with only a few ingredients and it tastes like I was cooking in the kitchen for half the day. This recipe is a simplified version of traditional Indian cuisine. I’m not going to lie and say it’s exactly the same as you would get in India. However, it’s easy, simple and very healthy. This recipe uses coconut milk as the main ingredient. Browning the chicken in a pan first, along with the onion and spices develops a deeper flavor and richer sauce. The Garam Masala can be found in any Indian grocery store, but I was even able to find it in my small town grocery store, so maybe it is becoming a more prominent spice. 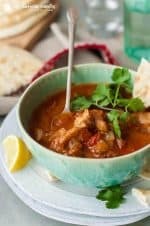 As pictured, this slow cooker tikka masala recipe is not Paleo or Whole30 (because of the naan bread) but it’s easy to eat it like soup out of the bowl or put over cauliflower rice or cauliflower mash. I’ve even seen Paleo naan bread recipes on Pinterest if you would like to try that. To make it Clean Eating, serve it over brown rice or quinoa. Traditionally this would be served over basmati rice, but all my family prefers jasmine rice. We like it because it has the most substance and is a little sticky and chewy. I never liked white rice until I tried jasmine and now I love jasmine rice. My children all love this slow cooker tikka masala recipe. We all love to go to the Indian restaurant near our house and the only thing my children want is tikka masala. I love eating there because my children actually eat real food instead of an expensive, tasteless, unhealthy kid’s meal. Getting a couple of dishes to share usually ends up costing as much as that. I like it because I get to try a wide variety of foods. I think MY favorite Indian food is either Indian saag recipe or Indian chicken korma coconut milk recipe, depending on the restaurant. Click the links above to get my recipes for both of those. The chicken masala we get from our favorite Indian restaurant uses chicken breast, but I don’t like chicken breasts in the slow cooker because it’s very easy to get dried out and tough. However, chicken thighs get soft, tender and juicy in the slow cooker. I think the tomato-based sauce actually helps tenderize the chicken thighs. If you don’t want to use coconut milk, you can use another milk alternative, such as almond milk – or cream is good too. Have you tried tikka masala before? Share in the comments below, we would love to hear from you! Share with all your friends you think might like this recipe! Browning the chicken in a pan first, along with the onion and spices develops a deeper flavor and richer sauce. The Garam Masala can be found in any Indian grocery store, but I was even able to find it in my small town grocery store, so maybe it is becoming a more prominent spice. Pour the diced tomatoes over the chicken in the slow cooker along with the can of coconut milk. Cook on high for 4 hours or low for 6-8 hours. Remove the lid of the slow cooker for the last 30 minutes of cooking to allow the sauce to thicken slightly. Wonderful ! I added a head of cauliflower at the beginning so it would take on the flavor and omitted any cauliflower rice (I’m on a Ketogenic lifestyle). It makes almost like a stew. Will make great leftovers for lunch at work this week. Such a good idea! We’re in love with cauliflower at our house and it would be so good in this recipe since it absorbs flavors so well. I loved this so much! The flavor is amazing and it’s SO easy. To make it even faster I threw the chicken thighs in whole and shredded them at the end. Thanks for sharing! Great idea! I’m glad you like the recipe. Thanks for commenting. I’m making this for the second time today! My family LOVES it and it’s so easy!! I do put the tomatoes and onions and spices as well as the coconut milk in the blender somthere are no chunks and then just pour over the chicken….the crock pot does the rest! Thank you so much!! What a great idea! Thanks for the comment. Thanks for posting! Found this recipe on Pinterest. I’m excited to try it. On step 3 it says tomato sauce but the recipe calls for diced tomatoes. Is that what you meant? Also, do I drain the diced tomatoes or leave the liquid? Thanks for your help! Good catch! Sometimes I change the recipes around so much I miss things. I don’t drain the diced tomatoes, but what do sometimes is blend the diced tomatoes, so it’s more like a tomato sauce and there aren’t chunks. My children don’t like the chunks as much and it’s more like spaghetti sauce when you blend it, so they like it better. I am currently doing Whole30 and just made this recipe last night. Served with cauliflower rice and it was FANTASTIC! Best compliant meal I’ve made so far — bonus is that it made lots of leftovers too! So good to hear. I’m glad it worked out for you! Hum. It’s not showing that now. Maybe I already found and fixed it . . . but it should be six. OMG. Late to the party on this one, but just discovered this recipe and made it tonight. Holy smokes, is it GOOD!!!!!! Thank you for posting! No more trips to substandard Indian takeout restaurants for me! Yes you can but I would be careful cause I am not sure it would fit in one crock pot. Use your best judgment. How do you convert the recipes for your pressure cooker? For most crock pot recipes instead of cooking it on low for 6-8 hours, you just put it in the pressure cooker and push the button for what it is you’re cooking, like there’s a meat button. You push that and it cooks the meat for however long it thinks it takes. Meat is usually around 15 minutes after it gets up to pressure, so like 25 minutes or so. But I often put frozen meat in so that’s why it takes a little longer. Rice takes 12 minutes and it’s chewy and sticky. I love it. Oh yumm! Garam Masala is a staple in my pantry already. I look forward to trying this version of Tikka Masala. One of our local grocery departments has bulk sales on different chicken chicken cuts each week. Next time they have thighs on sale, I’m stocking up! Naan bread is simple to make too, for on the side. 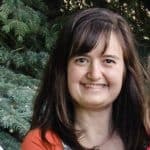 Thanks for sharing your crock pot recipe. YUM! Love me a good slow cooker recipe. Chicken Tikka Masala is one of my FAVORITE meals!!! Can’t wait to try this!! I love slow cooker meals. This would be a good one to try!